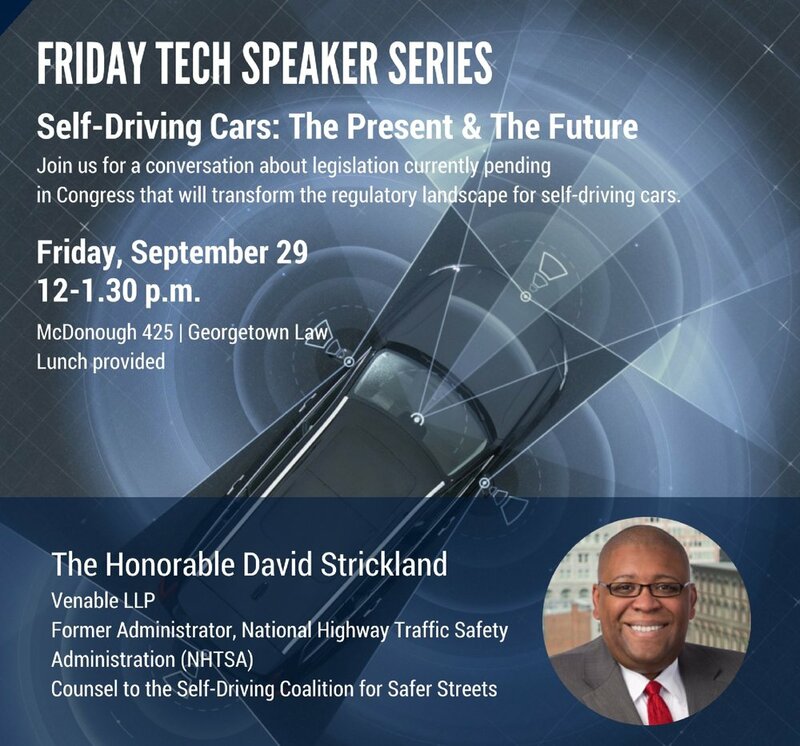 Our regular Tech Speaker Series kicked off Friday with a discussion on self-driving cars featuring two leading experts in the field: Joan Claybrook, former Administrator of the National Highway Traffic Safety Administration (NHTSA) (1977-1981) and President of Public Citizen (1982-2008), and David Strickland, former Administrator of NHTSA (2010-2013) and now counsel to the Self-Driving Coalition for Safer Streets. In a dynamic debate, the speakers discussed the Trump Administration's recent revision of NHTSA's guidance for the self-driving vehicle industry, and legislation currently pending before Congress that would significantly increase the number of test vehicles permitted on the road. The conversation ranged from the size and scope of the exemption for test vehicles, to considerations of privacy, ethical questions, and security, to NHTSA's capacity for regulating the fast developments in this industry, and the appropriateness of preempting states from regulating in this space. The meeting was the first in a series of regular events hosted by the Tech Institute on campus. If you want to learn about future speakers in this series and other Tech Institute events, join our mailing list here. Institute Director Alex Givens (L) moderates a discussion with The Hon. David Strickland (C) and The Hon. Joan Claybrook (R), two former Administrators of the National Highway Traffic Safety Administration.